The purpose of this blog post is to have a place to quickly compare the two weather stations I have in my backyard. The top “sticker” is for our Davis Instruments Vantage Pro 2, circa 2004. This weather station has performed reliably for our family at each of our last four homes. The bottom “sticker” is reporting from our AcuRite Pro Weather Center. It just arrived about a week ago as part of a GeekMom product test. This is part of my comparison project — I have Weather Underground archiving both weather stations’ data. I can only choose one weather station with which I can associate the webcam, so it’s on the incumbent weather station. So…what you SHOULD be seeing are similar temperatures, dewpoints and barometric pressures. I’m not convinced the wind data will match very well, the Davis anemometer is very old and doesn’t seem to be spinning as well as it used to. Comment below and let me know what you think…. I met up with Ms. Gray the day before the interview itself to verify the time and location. Don’t worry, I wore something a little more professional to the interview itself. I did something completely out of my comfort zone recently. 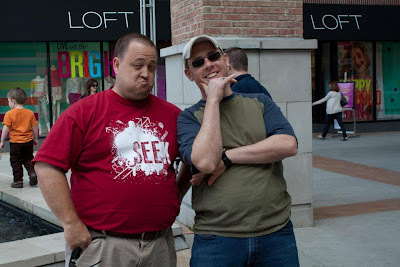 I interviewed somebody and then wrote about the interview for GeekMom. It had nothing to do with meteorology or the Air Force — so it was pretty tough for me. Because I had applied for media access to attend Dragon*Con last Labor Day weekend (i.e., a free four-day ticket! ), I received an invitation to request interviews with up to three celebrity guests of my choosing. There were a few rules, such as each media outlet (in my case, Wired.com’s GeekMom blog) having a limited number of guests with whom we could request access. I believe we could only interview five guests total, but each individual in the group could only request three. I don’t remember the specifics. The other GeekMom at Dragon*Con with media access got interviews with Jane Espensen (writer and producer of such shows as Buffy the Vampire Slayer, Torchwood and Once Upon a Time) and John Barrowman (star of Torchwood and guest star on BBC’s Doctor Who). I looked at the guest list and decided to look for fellow geeky moms to interview. 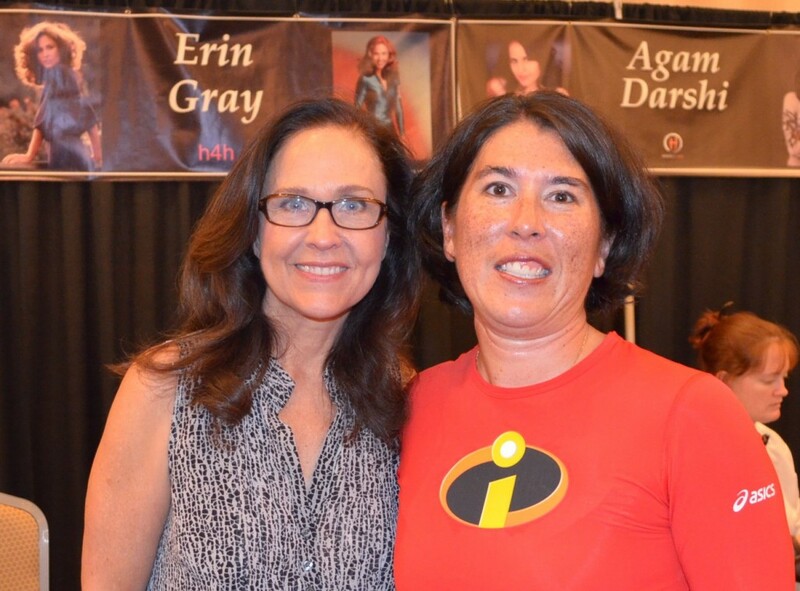 I found two that caught my attention: Erin Gray (of Buck Rogers and Silver Spoons) and Kathy Najimy (of Sister Act, Veronica’s Closet and the voice of Peggy Hill on King of the Hill). Both were involved with their acting careers while their children were young, and both actresses are strong outspoken women who support causes that empower women. 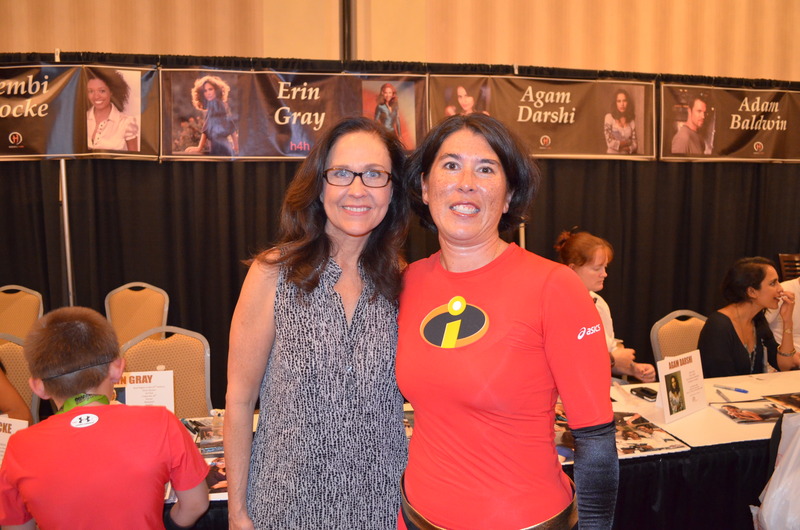 The afternoon before leaving for Dragon*Con, I received an email with a date/time/location for an interview Erin Gray. I never did hear back from Ms. Najimy. I was pleased as punch, but also nervous! I had one evening — on top of packing for the long weekend — to figure out questions for Ms. Gray. I consulted fellow GeekMoms who were very helpful in providing questions. I also consulted the Dragon*Con Media Relations website that had some good tips about researching our subjects and coming up with effective questions. 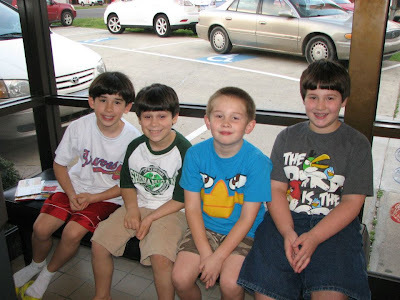 Dave took the boys to the NASA Robotics Workshop that took place at the same time as the interview. I expected maybe 20 minutes tops for the interview! 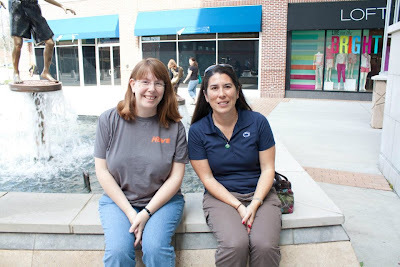 But Ms. Gray gave GeekMom a whopping 50 minutes of her time and she had so much to say in response to each of the 6 questions I had asked (I had 9 questions prepared; I didn’t expect to get through more than 4). I used my iPhone Voice Memo app to record the entire interview. This was great because I could write about all the other topics while they were fresh in my mind, and when I was ready, I was able to replay the entire interview. I went to Nebraska for some AF work in late September. In the evenings I could sit at the desk in my billeting (i.e., lodging) room and slowly transcribe the audio recordings. It took all week to get everything transcribed! When it was all done, it was over 6700 words transcribed! After transcribing the words, I had an even more difficult task ahead of me. How do I turn it into something people will want to read? I needed to tie together the answers to her questions into a coherent story, if you will. I had no idea how to do this. 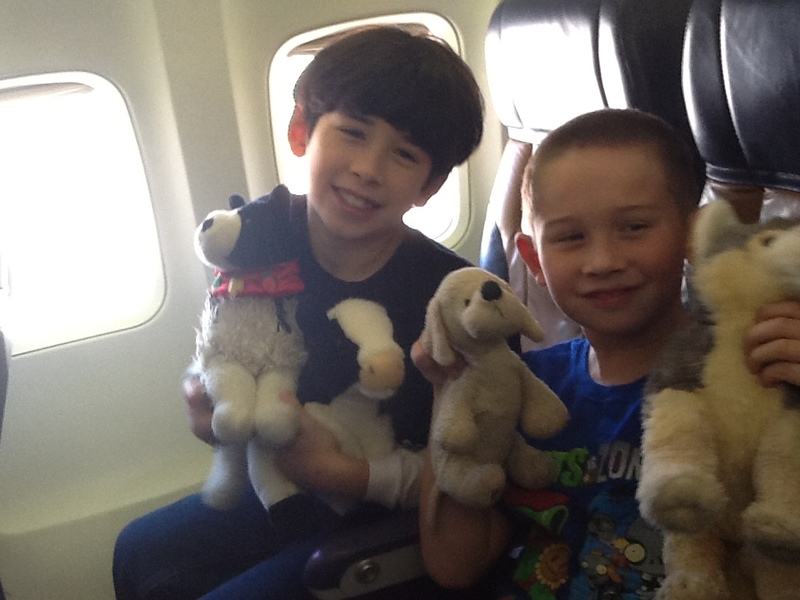 I read several other interviews that had been done on GeekMom, plus I looked at interviews with celebrities in magazines for inspiration (such as an interview with Zoe Saldana in the September issue of Delta Airlines Sky magazine, available on my flight to and from Omaha). I got advice from other GeekMom writers, they gave me an idea of what liberties I could take with the raw transcripts to make the storylines flow more smoothly. It was still difficult. It took me 10 calendar days (not all at once, but I worked with it on most evenings) to put it all together. Then I proofread it, and then proofread it again…and again…and again. Procrastinating on the post was a blessing in disguise, actually: my moving the publication of the post into October, we were able to tie in Ms. Gray’s involvement with October’s Domestic Violence Awareness Month activities. Anyway, I did my best with it, but not without a lot of soul searching and being near tears several times, wondering “What did I get myself into?” I’m a meteorologist, not a journalist! 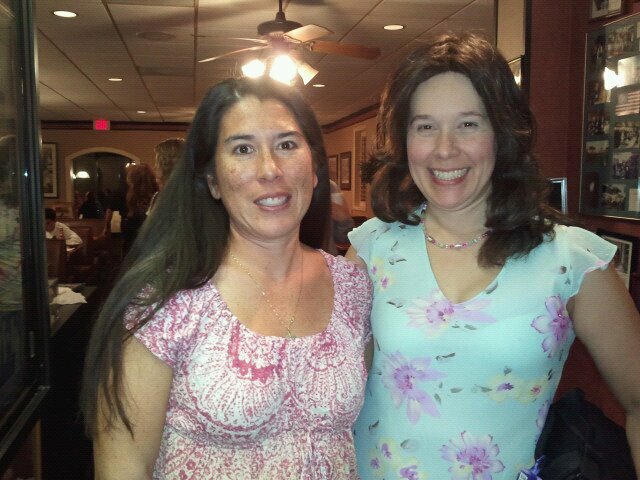 I was then met with another challenge — this interview write up quickly turned into the LONGEST post I’d ever done for GeekMom. So I asked the GeekMom editors for advice on whether to break up the post into multiple parts (which I had done with my writings about the Facebook Timeline and our Disney Cruise) or leave it in one piece but allow readers to page through. I decided to leave the interview write up in one piece and it ended up at around 4900 words. Definitely a record for my 20 months with GeekMom. My average post is between 1000-2000 words. (If only I got paid per word…some writers can earn 50 cents to several dollars PER WORD!!! But that’s okay, I have a job already….). We all know who that is on the left. But who knows who’s standing on the other side of me? It was SO SCARY how well he nailed the character! 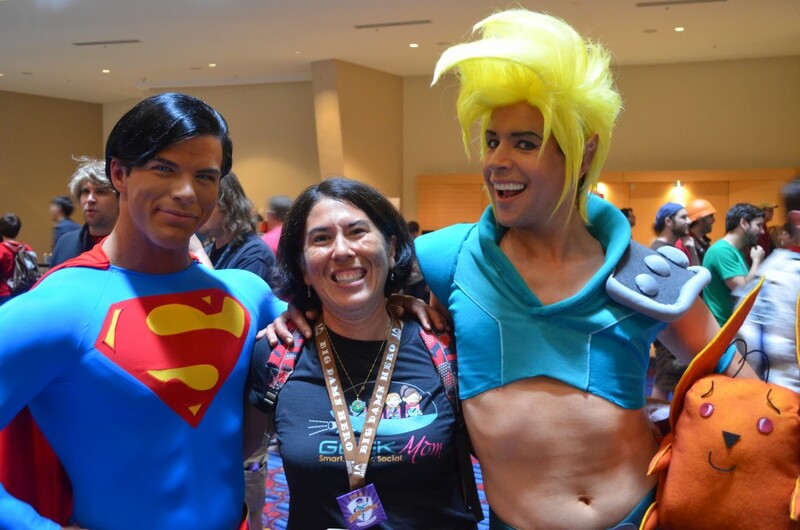 This post has been a long time coming…but because GeekMom’s credientials got me a free press pass into Dragon*Con, I had to write all my Dragon*Con related posts for GeekMom first. Our whole family drove up to Atlanta over Labor Day weekend and stayed in a hotel near Turner Field so we could also enjoy a Braves game (for another post). Learn more about the history of Dragon*Con here. Do you want to go to Dragon*Con? Here’s the website. Since I’m heading on a jet plane for Nebraska in the morning, I figured for now I could simply refer you to the posts I had written over the past 2 1/2 weeks for GeekMom. That about sums up the fantastic weekend we had! I have a lot more posts forthcoming (about a plethora of topics) as I have a few days to myself while I’m working. The boys couldn’t get enough of all the costumes! They were indispensable when it came to identifying some of the characters, especially from Pokemon and the more obscure Star Wars characters. I had never been to a fan-con, and it was a pretty amazing experience. I was probably a bit over my head with how intense some of the fans are. I didn’t even attempt to wait in the very long lines to meet some of the more popular fans (such as Torchwood’s John Barrowman and Batman’s Adam West and Burt Ward). The parade was a totally new experience for our family, especially the part where we publicly appeared in costumes somewhere other than on Halloween or a Civil War reenactment! 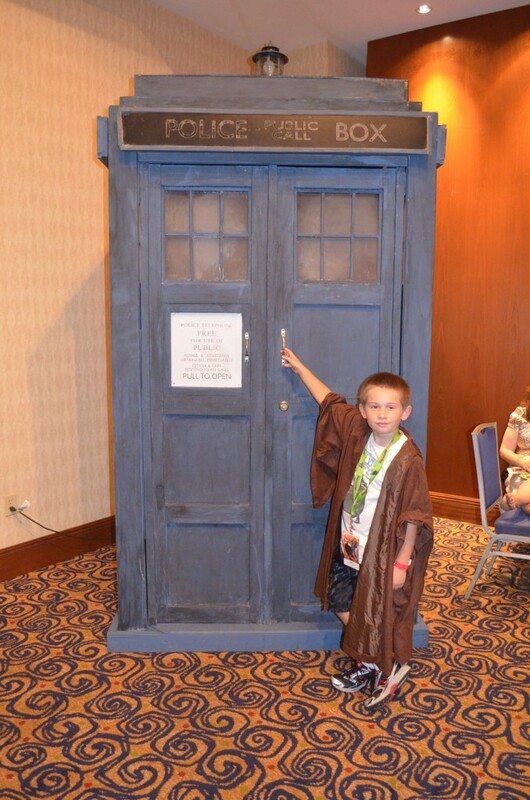 For those who didn’t know, Timmy became a Doctor Who fan this past summer. I’ve been slowly working my way through 2005-and-later episodes on Amazon Video and he often joins me. He loved seeing the Daleks, TARDISes and fans dressed as the several variations of The Doctor. The next Dragon*Con post I plan to write will be an interview with the amazing Erin Gray, who starred in Buck Rogers in the 25th Century in the 1970s, and Silver Spoons in the 1980s. Ms. Gray’s accounts of being a working mom in a challenging marriage were very moving. It was also very interesting learning her story of how she turned to alternative medicine and tai chi as a way to keep from delving down a road of drugs and alcohol, like so many of her colleagues. Dave is a huge fan of The Simpsons . 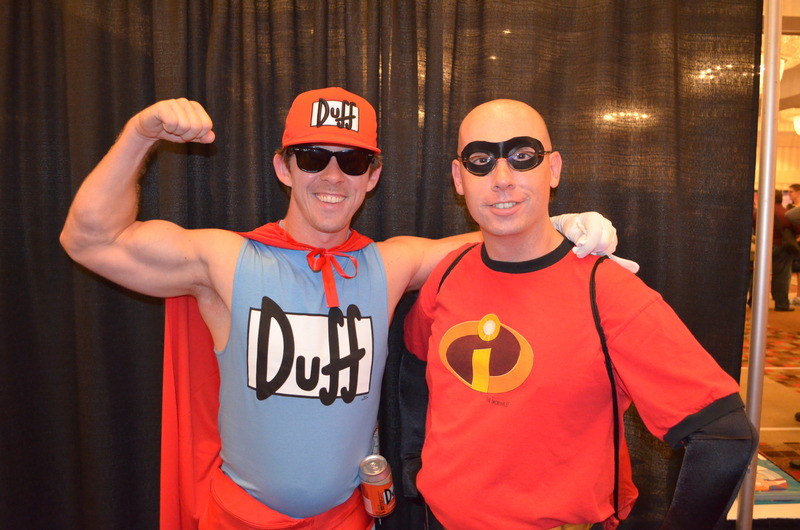 He found not only Duff Man, but also a group of Stonecutters! 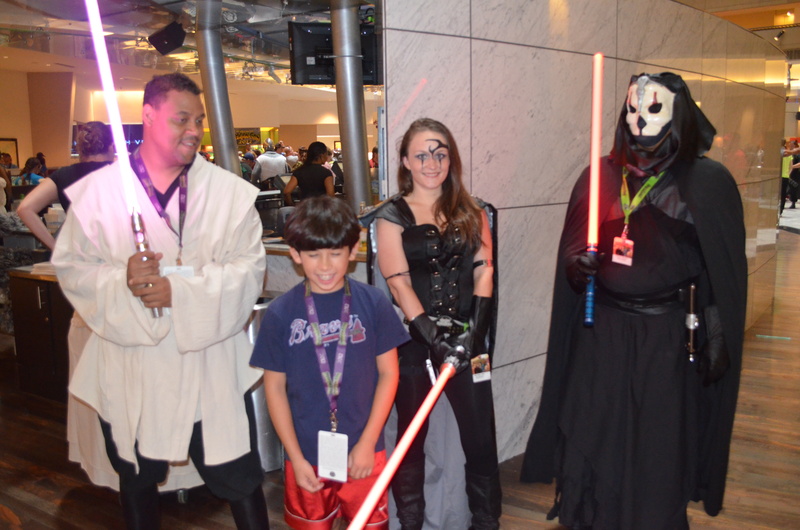 Here are my four Dragon*Con Diary posts, enjoy! Last weekend we were at our local mall-like-shopping-location. It isn’t really a mall, since it doesn’t have that old-school enclosed building thing going on. It’s one of those open-air places, where you walk outside between the pretty-people stores. Each of the past four locations we’ve lived has had one nearby. Most of you who live in suburban America know what I’m talking about, right? My kids begged “Please? Please? Please?” for one of the kits, and since my youngest son is celebrating his sixth birthday this week and we had family in town, I caved in and let him choose the kit of his choice. I’m so glad he picked the Rebel Alliance kit instead of the Galactic Empire one. I thought the set was pretty cute, and at the time I didn’t think anything of paying $12 for it. How could I turn down classic Star Wars??? Tonight my mom and I made some cupcakes for dessert, using half of the baking cups and toothpicks. That’s what this kit is: baking cups and toothpicks. Probably about $1 worth of product, to be honest. We devoured the cupcakes and the used baking cups went right into the trash, but I made a point to insist that no one lick the toothpicks and I’m making sure to recycle them. The pictures on the toothpicks are made of a slightly-waxed paper. Not quite cardstock, but a little heavier than just plain paper. My opinion? Twelve dollars for this kit is a considerable indulgence. My kids were smiling all evening from the cute toothpicks, and one could argue that doesn’t make this all a waste. 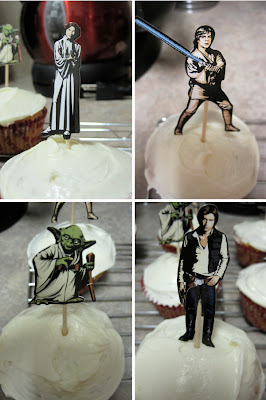 If you aren’t picky about the baking cups — considering R2, C3PO and Chewie were all on the bottom of the finished cupcake where no one will really see them — you might be able to get away with making the toothpicks on your own. Consider how many different characters you could glue to toothpicks and stick in cupcakes! Maybe this is what I’ll do for the Mario Brothers cake that’s been requested for the party next weekend. Originally published on Wired.com’s GeekMom blog on 24 Jan 2011. From GeekMom: Should We Dilute the Kool Aid? When I was little, I remember my mom making Kool Aid. I have pictures around of me wearing my token Kool Aid mustache. I even had a Kool Aid t-shirt. I remember sometimes the Kool Aid would seem, well, watery. Did my mom dilute it on purpose? Boy, I hope she didn’t. Sometimes, I wondered if she was sneakily reducing my sugar and artificial color. I do remember telling myself that when I got older, I would never dilute the Kool Aid! But guess what? While I do my best to make the Kool Aid at home to the recipe, I have to admit I water down the kids’ lemonade and fruit punch at the fast-food restaurant beverage machines. It’s just instinct, I WANT to dilute! This diluting of the Kool Aid is now a metaphor I’ve been giving to the crime of watering down — or dumbing down — answers to the questions kids ask. JennT posted earlier this week about the incessant “Why? Why? Why?” questions she receives from her kids and in her line of work. My kids do the same thing, and sometimes it grates my nerves for sure! But sometimes embedded in all of the silly mindless “Why?”s is a jewel of a question that my sons are truly curious about. And when my just-as-geeky-as-me husband or I hear such a question we want to stop and give it our full attention! And if it’s a science or math question? Stop EVERYTHING! Break out the props! My husband and I had a great professor in college who has a pet peeve about “bad meteorology” to the point he made up a website dedicated to debunking several of the most-basic of meteorology myths. A quote he said that has stuck with my husband Dave all these years was “Be very careful what you put into kids’ heads because it’s very hard to get it out!”. 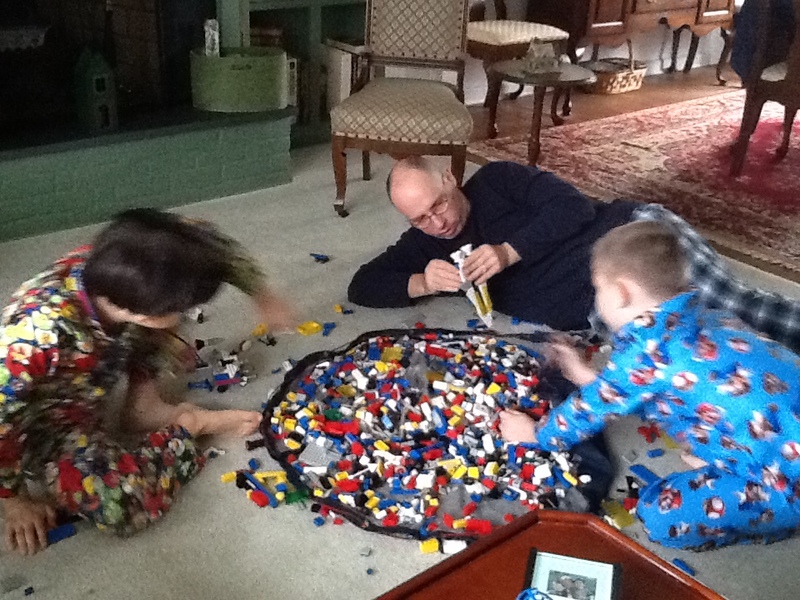 Dave and I take this very seriously with our kids. So when our sons ask a question like “Why is the sky blue?”, our approaches to the answer might be a little different than non-geek parents. For a pair of meteorologists with offspring, we waited for that very question with bated breath, as if it were a milestone like learning to walk or ride a bike! In our house, though, the question wasn’t “Why is the sky blue?” It was “Why are sunsets red?” We got it when our oldest son was about 6 1/2 years old. Definitely a corollary to the dream question! So I’m now going to share with you how we geek parents approached this subject. We started with rainbows. Jacob knew the colors of the rainbow by this point, so it was easy to explain to him how red is at one end of the rainbow, and violet is at the other. Then we discussed the electromagnetic spectrum. Enter a basic diagram, with the shortwaves on the left, the longwaves on the right. 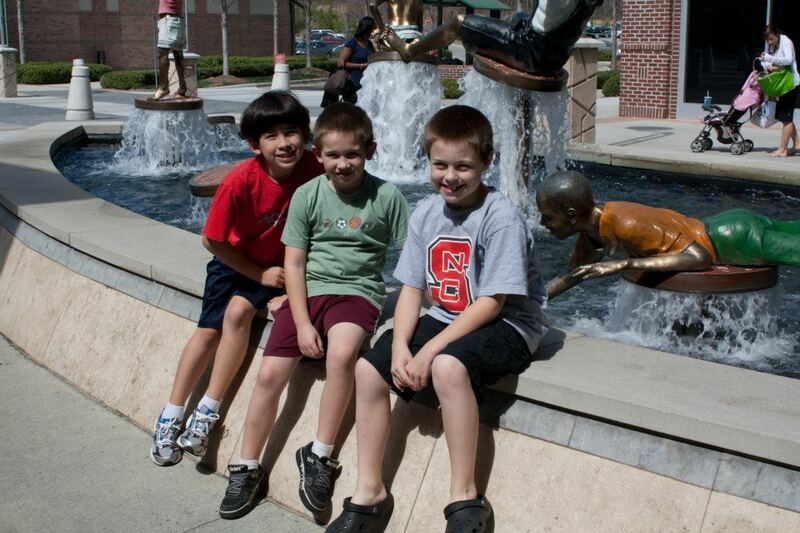 Jacob could name many of the parts of the electromagnetic spectrum, such as X-rays and microwave radiation. We explained how red light has longer wavelengths than blue/violet light. Jacob started getting a little glassy-eyed here…uh oh, it doesn’t get any simpler from here! We attempted to quickly sum up how the low sun angle at sunset allows sunlight to travel through more of the atmosphere, the color red is able to “scatter” just as readily as the color blue “scatters” when the sun is higher in the sky. When the sun is higher, most of the atmosphere’s scatterers are receptive to the color blue. 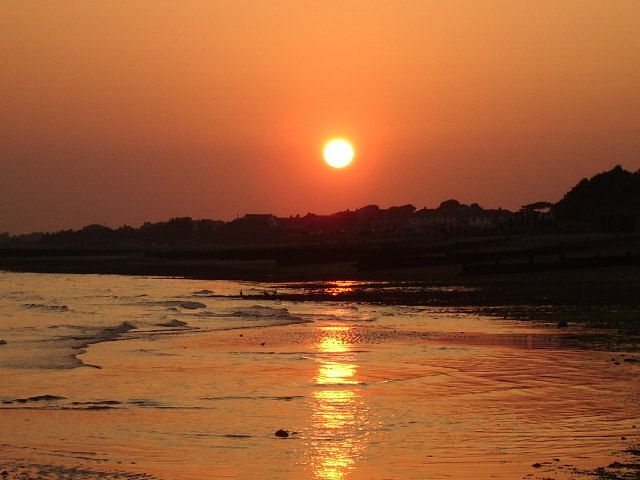 This is a phenomenon called Rayleigh Scattering. I fear we might have lost Jacob by this point, but it was interesting seeing how much he did pick up from the conversation. I remember that it generated more questions about the electromagnetic spectrum and I was so impressed with having a conversation with a 6-year-old about how many things in the world around us are traveling in “invisible” waves. The music on the radio. The remote control (or the 8-billion remote controls in our house!). The microwave oven. The wireless internet in our house. The satellite television. Check out these links for other easy-to-understand explanations of sky color. We, as parents, are challenged with teaching our kids the “right things”. At least, what we think are the “right things”. Sometimes those “right things” are contested topics such as evolution, global warming, the causes of the Civil War, etc. I hope to have an open enough relationship with my kids to discuss the varying viewpoints about those more controversial topics and give them the tools to form their own opinions, even if they might differ from mine. But when it comes to math and science, I personally feel challenged to push the envelope to teach as much as I can when my kids express interest. I hope to never blow off one of their “Why?” questions, although I have to admit that can get tough at times! Originally published on Wired.com’s GeekMom Blog on January 22, 2011.